Google Analytics is a free service offered by Google that generates detailed statistics about the visitors to your website. The GoDaddy Email Marketing integration automatically generates link tracking so you can see extactly how your email campaigns work together with your website. You’re already able to see how many of your contacts clicked through to your website thanks to tracking. By utilizing Google Analytics, you can see how long they stayed, what they clicked on, which pages they read, and where they went from there. Click on the Addons menu, and select Add more. Find the Google Analytics option, and turn it on. Then click Go set it up. 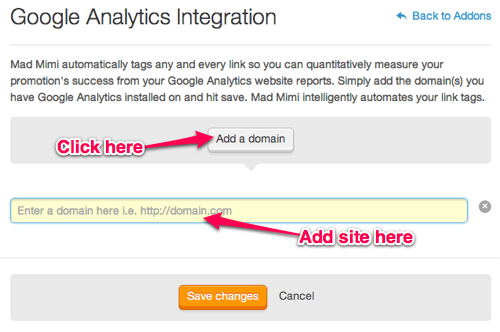 Click Add a domain and enter the url that is linked to your Google Analytics account. Repeat per domain if you have more than one. Click Save changes when you're done. 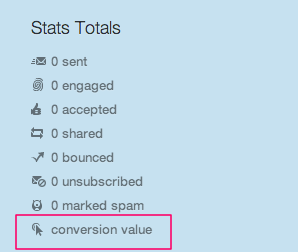 If you want to see your conversion value display in your stats, you can also use the Activate ecommerce conversion analytics button, to link your Google Analytics account even more. Conversions will appear alongside the rest of the regular stats. Now you're fully integrated :) We take care of the rest (provided you already have a Google Analytics account set up). To learn more about viewing your Google Analytics metrics, look here. Please Test, Before you Send! When you enable Google Analytics, the function will add unique parameters to your link redirect URL. There are some sites out there that just don't play nice with these changes. So, sending a test email to yourself, before sending the mass mailing, is SUPER IMPORTANT! If you send yourself a test, and those hyperlinks aren't working, don't worry! There is a simple test that you can try. Copy this URL, and delete everything from "utm_source" forward, so you're left with just up to the "?" - try just this first part of the URL. If that works, then there's a problem with your site and the Google Analytics parameters. If it doesn't work, then check that your domain is entered correctly into the Google Analytics addon. If you're sure it's entered correctly, then the problem is actually just with your domain. How Do I View My Click Through Rate and Other Details?